Nelson, a mix of English Bulldog x red Pit Bull, shown here at 2 ½ years old—"His mother was the Bulldog and dad Pitbull. He has an excellent temperament with children and other dogs male and female. He is very playful and energetic, but gets tired quite quickly like most bulldogs. He weighs about 85 lbs." The Old Anglican Bulldogge is not a purebred dog. It is a cross between the American Pit Bull Terrier or the American Staffordshire Terrier and the Bulldog. The best way to determine the temperament of a mixed breed is to look up all breeds in the cross and know you can get any combination of any of the characteristics found in either breed. Not all of these designer hybrid dogs being bred are 50% purebred to 50% purebred. It is very common for breeders to breed multi-generation crosses. An Old Anglican Bulldogge puppy at 1 month old—"The pups father is an English Bulldog and their mother is an American Pit Bull. 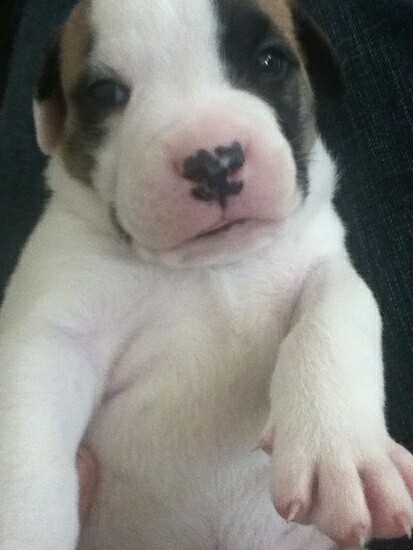 All the pups have brindle marks just like their parents who have the same markings of brindle on white." 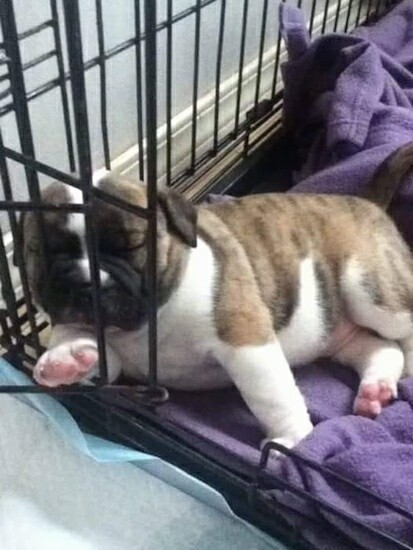 An Old Anglican Bulldogge puppy at 1 month old taking a nap in its dog crate. 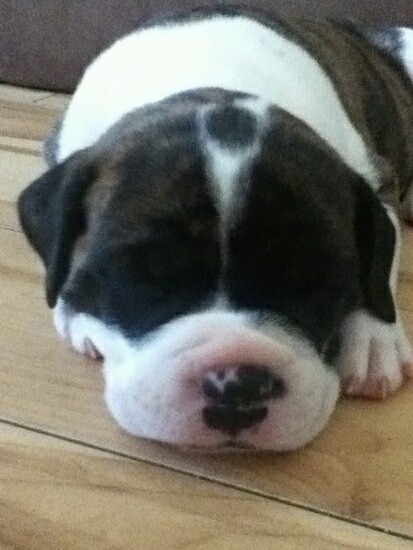 An Old Anglican Bulldogge puppy at 1 month old sleeping on the floor. F1b hybrid Old Anglican Bulldogge puppy at 6 days old—his father was an F1 generation Old Anglican Bulldogge (Nelson) and his mother a purebred Pit Bull. Simba, a red F1b hybrid Old Anglican Bulldogge puppy at 2½ months old—his father was an F1 generation Old Anglican Bulldogge (Nelson) and his mother a purebred Pit Bull. Bully, a fawn F1b hybrid Old Anglican Bulldogge puppy at 5 months old—his father was an F1 generation Old Anglican Bulldogge (Nelson) and his mother a purebred Pit Bull. Lennox, an F1b hybrid Old Anglican Bulldogge at 9½ months old—his father was an F1 generation Old Anglican Bulldogge (Nelson) and his mother a purebred Pit Bull. Lennox (right), an F1b hybrid Old Anglican Bulldogge at 9½ months old standing next to his father Nelson (left), who is an F1 generation hybrid Old Anglican Bulldogge. Nelson's mother was the Bulldog and dad was a Pit Bull. 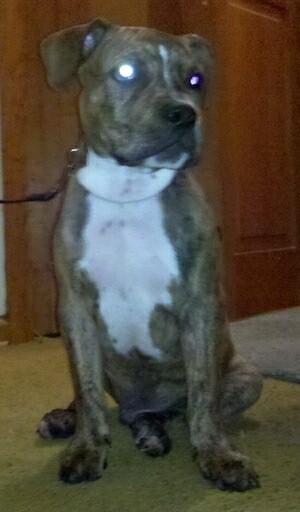 Nelson was bred with a purebred Pit Bull, producing Lennox. "This is our five-month-old puppy Bullie. 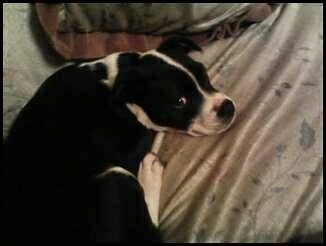 He is a Bulldog / Pitbull mix. The breeder told us that Pitbull was bred with a Bulldog many lines back in the bloodline. The parents of Bullie looked like English Bulldogs on steroids. They were both very sweet and had huge apple heads. We feel in love with him as soon as we saw him. He has a great temperament. We have had Pitbulls before that were very hyper and hard to calm down. Bullie gets hyper moments, is still a baby, but he calms himself down. He is very sweet and protective, but he loves everybody. He gets along great with other dogs and with cats. He is one of the best dogs we have ever had. We know now that he was sent to us." Ju'dah the Old Anglican Bulldogge as a puppy—"Ju'dah's mother was an English Bulldog and his father an American Pit Bull Terrier. 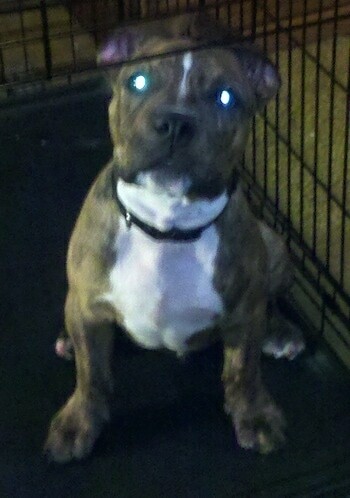 He is very energetic and strong willed, but tires a bit faster then a full blood Pit Bull. When training, food, ice, bones or a game of tug seem to work best for motivation. He is a super fast learner if you have established pack leadership. He is very affectionate with all people." "Peanut the Old Anglican Bulldogge puppy—her mom was an English bulldog and her dad was an American Pitbull. 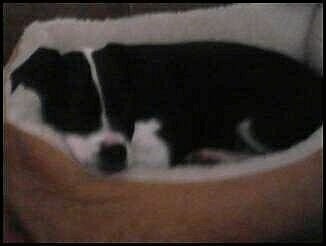 She is a major snuggler, very hyper and in general a great puppy."